From Haines Junction, turn south onto the Haines Road (Highway 3). Drive for about 140 km to a large pullout on the right (west) side of the road. 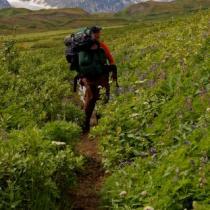 This pullout is in the subalpine just before the main Haines Pass summit. The pullout has an outhouse at the far end and ample parking room. The trailhead follows an obvious old mining road from the parking lot. The elevation gain is relatively small, making for an easier hike. Follow the road through the sub-alpine as it winds its way alongside Nadahini Mountain. Keep your eyes out for grizzlies and make frequent noise, as it wouldn't be a surprise to see one in the valley or on the mountainsides. There are numerous creek-crossings which are small. 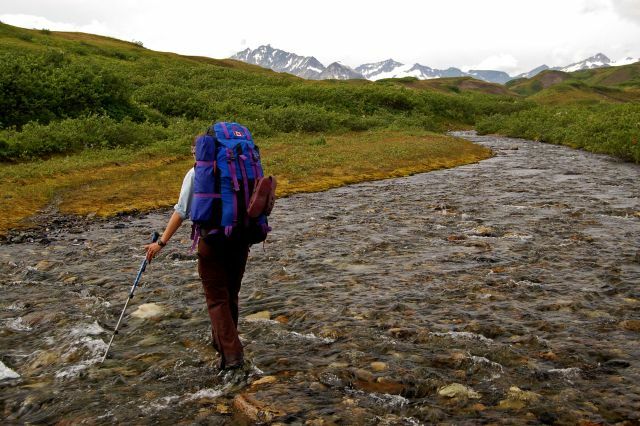 The only creek that may make you take your boots off is after 6 kms. 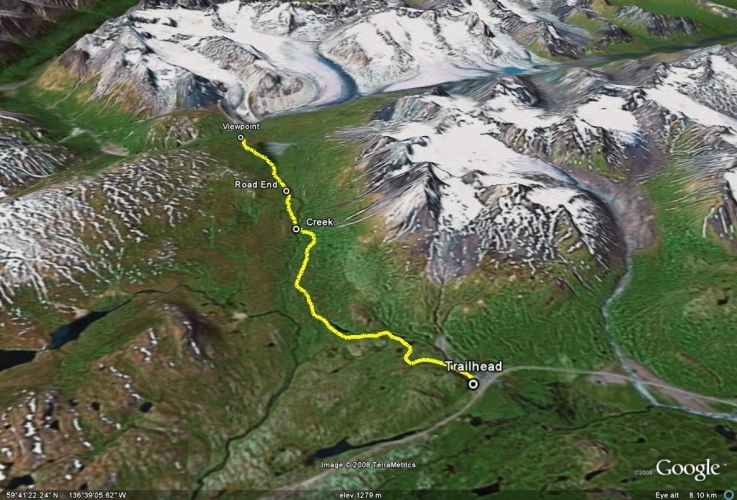 After 7 kms on the road, it will end and you will have to pick your own route to see the glaciers at the end. The valley bottom ahead is a bog, so it is advised to gain higher ground on either the left of right side. 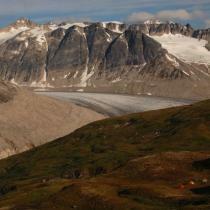 Going left offers a good view of one of the snouts of Samuel Glacier and a small peak to climb up to. 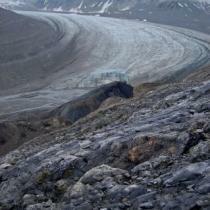 Going right offers a good view of the larger snout of Samuel Glacier. 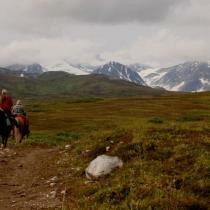 From the end of the trail you can camp, turn around, or explore further enjoying the glacier view. There is a valley separating the viewpoints from the glacier. 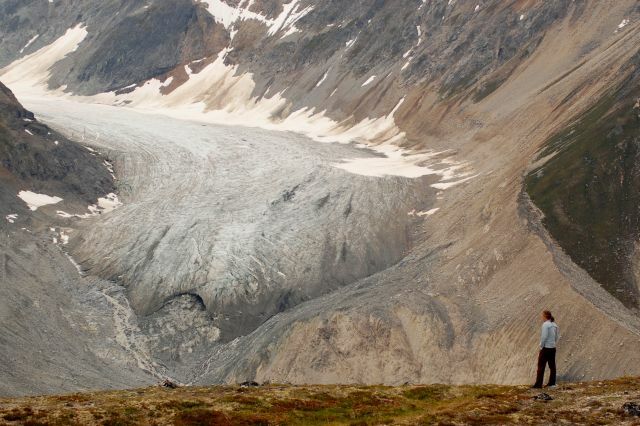 To reach the glacier, you would have to continue hiking to the right (north-west) for some kilometers. 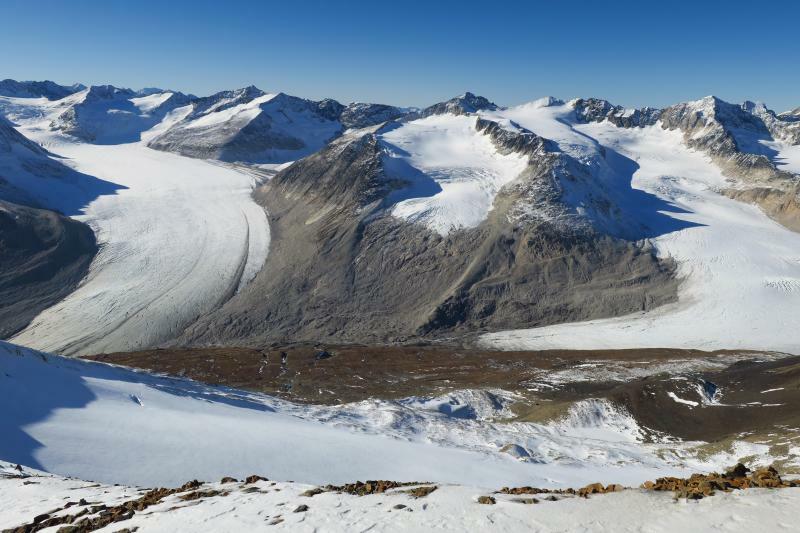 Although Samuel Glacier isn't overly crevassed, it would not be safe to walk on or get too close, unless you have the proper gear and glacier travel experience. 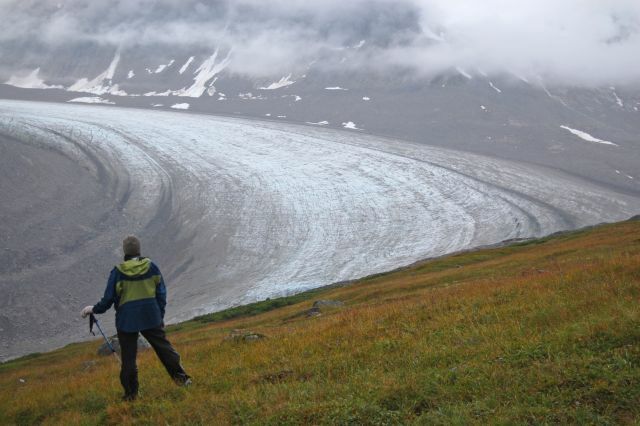 Have you been to Samuel Glacier lately? August 2018 Started later in the day but didn't realize it was that far. Didn't do research and happened upon it. Decided to camp overnight and do it properly the next day. Spectacular. On a clear day to boot. 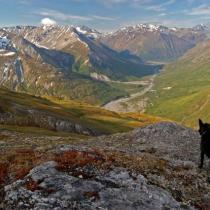 One of the best hikes of our five week trip to the Yukon. Hike this trail on July 1st 2018. Highly recommend it. Great views into the valley and rewarded with amazing scenery in the end. Trail in wicked condition, well beaten and only last 4km needs a bit of trail finding. We did it in a day but wished we made it a 1 night trip so we had some more time to explore the glacier area with some side trips. Recommend when arriving at the end going for another 2-3km further north to get some amazing views of the other glacier. Hiked this on June 27. Trail was totally snow free and only a bit muddy in upper sections (it was sunny and it hadn't rained for some time - I could see this being muddy in periods of rain). Creek crossings were mostly easy, with only one requiring me to take boots off (and it's likely that someone more bold/long-legged could've kept them on!). Was glad to have worn pants to save my legs from the alder when dodging muddy sections and for the wind coming off the glacier. As described, the trail follows an old mining road so if it weren't for the incredible scenery, this could be a fairly dull hike. Only saw 3 other people on the trail that day. We were tight on time this day, so we opted for the trail to the left in the meadow and turned back before we'd have liked to. Next time we'll opt for an overnight or ride our bikes in -- there is so much exploring to be done up there. Unreal area!! This trail is actually called the Chuck Creek Trail as noted on signage at trailhead. 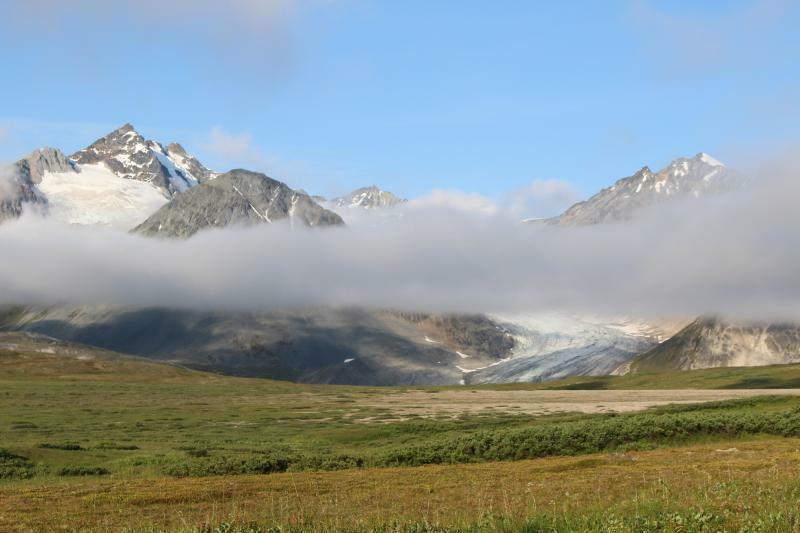 We day hiked in on August 16, to see three tongues of Samuel Glacier. Weather had cooled off, and surprisingly bugs were not a problem anymore (though for KB they had been -see below). Also, no signs of any bear activity at all, which surprised us. Only old diggings. They must have still been over with the salmon runs that were happening a bit later this year! We followed the right side of the bog when the trail petered out. Found trail off and on, but not clear at all. View is wide open to make your way though, so just keep above the sinking and you'll be fine. Boots a must, gaiters even better! 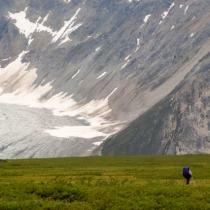 When we continued veering right over the alpine meadow hills, more tongues of Samuel Glacier come into view. 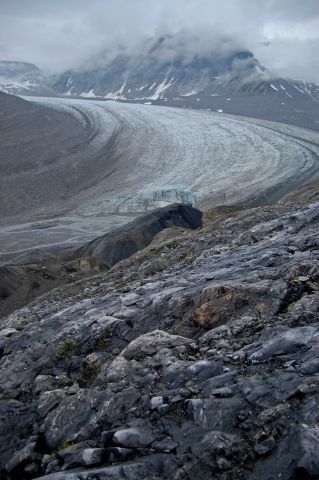 You could easily head downwards to get up close and personal with the middle glacier tongue, and have an endless choice of camping spots away from anyone. 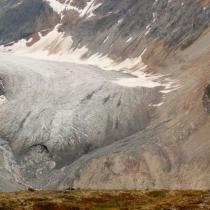 Note, the glacier you see after a couple hours hike in is not the biggest one! We stopped for lunch in front of the first one we saw, but glad we wandered right to get closer to the other tongues of the glacier. We even spotted some cool, yet small cave openings in the ground along the way. Probably a decent cave system under them ther hills! Did this hike as an overnight the weekend of August 5- probably the hottest and most beautiful weekend of the summer! Thanks for Norman's comment,below, we were able to find the trail again by sticking to the right after the trail peters out- one small creek crossing and we found the trail again while also getting out of the boggy valley! One thing to note- the bugs were horrific and some of us got pretty chewed up from deer flies and horse flies. Bring lots of strong bug spray and a bug head net if you've got one! I was fine with a long sleeve top and pants, but a stronger bug spray would have helped! As of yesterday, the trail past the first major river crossing is quite muddy and snowy. I would suggest wearing waterproof hikers! Also, walking in the rocky valley bottom near the end of the hike is suggested..its dry and flat! I guess you can start seeing the glacier about 16KM into the hike. So it would be nice to at least get there even if the views are nicer once you get close. Other than that, you still have nice views of the mountains even if you don't make it all the way. So I would say yes it is still worth it, but it would be really worth it to get to the end! Hi, would this trail be worth it if one could only do a couple miles in? Thanks much! 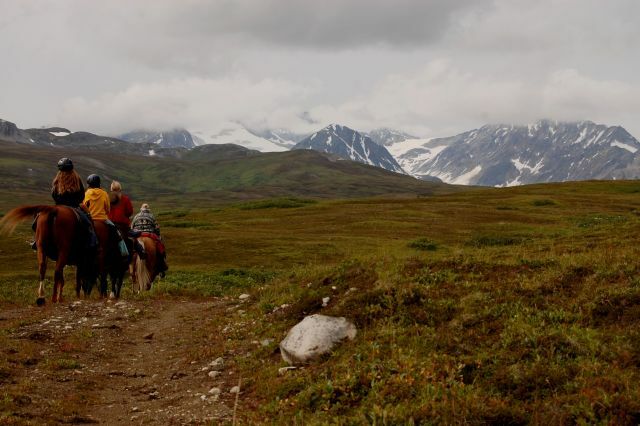 Hi we are coming from Winnipeg on June 30 to Whitehorse/Kluane and are looking for affordable guided hikes about 4 hours we are both fit (intermediate). Normally we hike alone but I a bit nervous about grizzlies, not having any experience on that front, so prefer to be with an experienced guide. Any suggestions? Thanks! 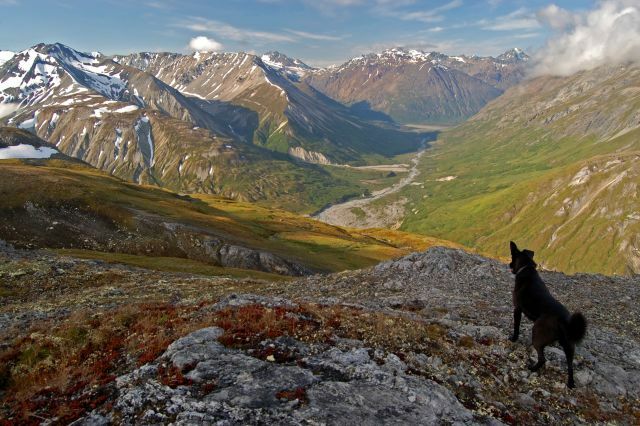 Hi, we were in the Haines Pass area for the last few days and there still is a lot of snow left, way too much for a hike actually. It has already started to melt pretty fast since yesterday, depending on the weather conditions it should be all good in a couple weeks in my opinion. We spotted a black bear not too far from the start of the trail. Anyone tried to hike recently? 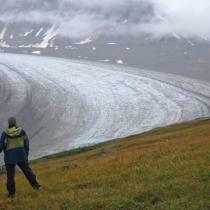 Hiked to Samuel Glacier on Sun Oct. 9th. We stayed on the left side (South) of the meadows after the trail becomes indistinct to avoid the wetter sections but decided to cross to the other side and make it to a further viewpoint closer to Samuel glacier at GR012174. 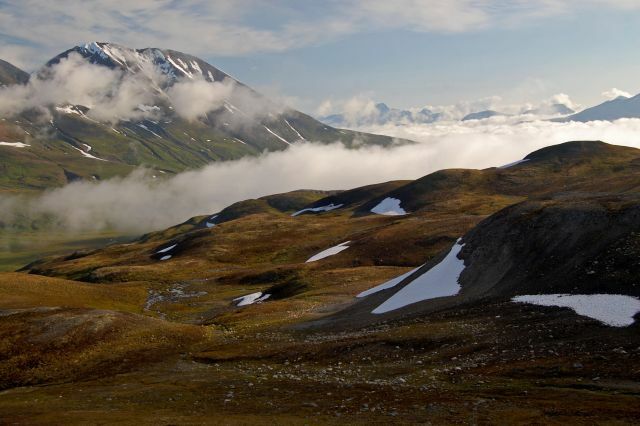 We then continued in a E direction to intersect with the ridge of the mountain right across Samuel Glacier. 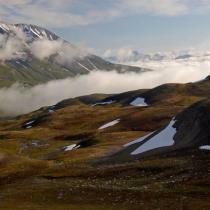 We worked the easiest line of ascent on the E side of the ridge up scree slopes and made it to the summit at GR021194. This is an incredible viewpoint and a worthy objective in the area. We came down the way we went up and followed different ribs back down the valley, this time staying on the left side (North) to meet up with the old road. We day hiked the trail on August 27th. The trail was in good shape, a little wet in some places but not bad. Kept our eyes open but luckily no bears for us. Saw some prints around kilometre 3 but they were days old. After the trail peters out, stick to the right and try to find the old vehicle tracks. Stay up higher and then come down onto the rock river bed. There are some rock markers but they are few and far between. Dry weather and a beautiful hike! Hiked to the glacier over Discovery Days. Encountered three separate bears and set off bear bangers at one point when they got too close to camp. Make sure you eat away from campsite and take a bear keg. Be extra bear aware since a lot of activity in this area. 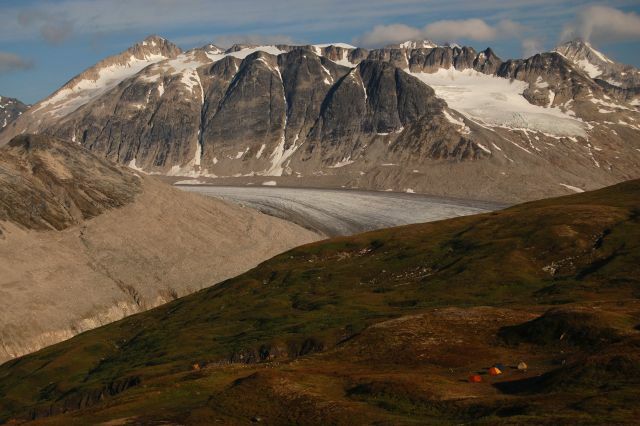 We did an overnight camping trip at Samuel Glacier this weekend and had a blast! 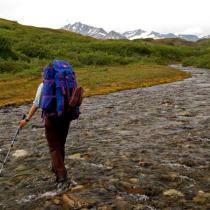 The trail was easy to follow and the creeks were not too bad to cross. The bigger creek at 6 km was pretty shallow, but definitely required to take our boots off (would recommend a good old pair of crocs for that matter so you can stay dry and still have some kind of firm footing). The trail was muddy in some parts so a pair of waterproof boots is a must. We set camp around 8-9 km in the meadows on the right side of the creek. On Saturday night right after our meal, we saw two Grizzli bears approaching in our direction on the left side of the creek (about 200 meters from us). They stopped and watched us for a while but then walked away and did not look interested in us. We definitely recommend to follow good bear safety practice such as cooking and storing your food far from your cam, and using bear canisters. No other bear sight to report that weekend. We hiked Samuel Glacier last weekend for the first time. We didn't see any bear but it was pretty crowded because of the long weekend. The trail was pretty muddy at some points and very wet, specially after the Km 7, where you have to start picking your own route. We highly recommend a good pair of waterproof boots. We tried to get down to the snouts of the glacier but we couldn't find a safe way to do it. Does anybody know the best way to get there? Does anyone have an update on trail conditions? Bear sightings? 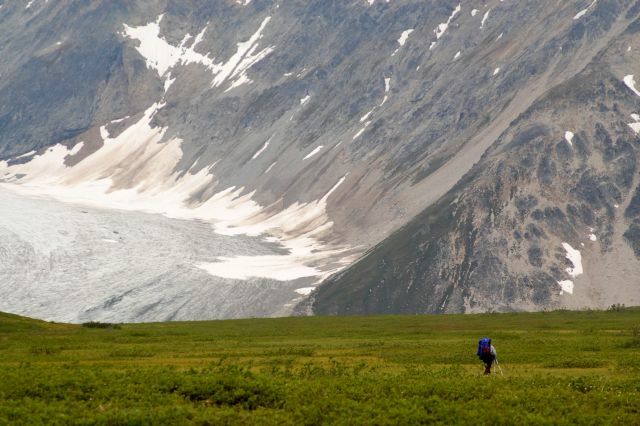 Has anyone hiked into Samuel glacier yet this season? Just wondering whether it's still snowy/wet or whether it's nicely dried out with the warm spring we've had. Has anyone tried to hike it in the winter/spring? Hey folks, beautiful hike & amazing views of the glacier. It is by far one of my favs this summer. I am writing this comment just to give caution to a bear sighting on the trail: The bear was approximately 100ft from the pull out and on the trail at 7.00pm. I detoured along the ridge of the creek and highway to get to my car. Great hike, but quite wet and lots of mud/bog. Spent two nights camped just above the valley on the left side, and a full day wandering the valley and surrounding peaks for some exceptional views. Highly recommend heading up the peaks on the left side of the valley for some spectacular views. Trail is largely bikeable, but with the mud and overgrown willows, not likely to be a real enjoyable ride, and you'd have to ditch your bike at the end of the trail and continue by foot, or maybe fat bike to the end of the valley. Just did an overnight here this weekend. No bear sightings, but did see some prints in the mud. The trail is rideable for most of the first 7km, but don't think it would save much more than 30ish minutes to the end of the trail. After 7km it's a choose your own adventure whether you decide to go left or right. We went left, cut through the boggy meadow for a bit then went higher. Hiked in until we found a spot we liked, overlooking the glacier and the mountains that run perpendicular to the valley you hiked through. 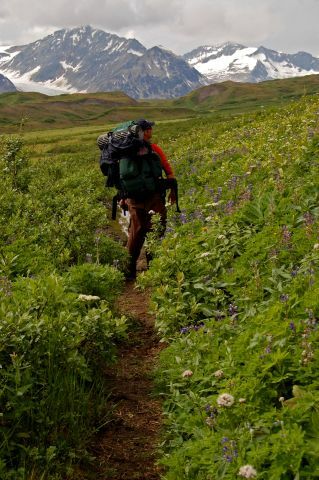 In short, gorgeous hike, and a high return on your hiking investment. has anyone here tried biking in? If the answer is yes, how far were you able to bike in? Followup question: did using a bike make a day trip totally doable, or still a big push? The hike was absolutely lovely and dry. Make sure you leave early so the creeks aren't too high.If you stay on the left hand side after it is marked road end, you wont have to cross the creek again. Make sure you have some skills in route finding since you might lose the road a few times, but other than that it is absolutely amazing. At the end of the road, where it is marked "Road End" in the map, if instead of staying on the left side of the creek you cross over to the right side, about a hundred meters or so after where the road ends, you'll see a much nicer trail (the road continues) on the right side of the creek.